Greetings from American Samoa. 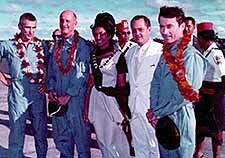 The Samoa and Apollo web site is devoted to providing information and photographs of the Apollo missions that came through American Samoa. American Samoa is the only U.S. Territory in the South Pacific. Ninety percent of the population is Samoan. The Samoans still have their traditional social structure and though most Samoans speak English the Samoan language is still their first language. I have lived here for a total of eleven years as an archaeologist and deputy historic preservation officer for the local government. In the course of living here I found out that many of the Apollo missions to the moon of the late '60s and early '70s splashed down near American Samoa and that the astronauts from many of these missions came through here. When I discovered this I began to do research on the topic and found that this aspect of the Apollo missions had been neglected by historians and movie makers alike; yes, Apollo 13 did splashdown here. In order to correct this blind spot in the history of the Apollo missions, I created this site. My goal is to provide information on each of the Apollo missions that landed here. You will find a brief summary page of the missions that came through here and then separate pages devoted to each mission. As I find new information I will add it to the site. If anyone has any information on American Samoa and Apollo that they would like to share, comments about the site, or questions about American Samoa and the Apollo project, please contact me (see contact info below), or make use of the guestbook. If I don't know the answers perhaps some of the other visitors will be able to help. This page has been visited times since May 11, 2006.
International Airport, Tafuna, American Samoa. Click on images or text below to go to the page indicated. Vote for this site "Top 10 of the Pacific"